Happy Mothers’ Day! My mother was QUITE the believer in prayer – I used to call her the “Queen of Novenas” – and I’m pretty sure that she had a patron saint for EVERY special need. And with having raised 6 kids, including yours truly, otherwise known as the “Handful”, I’m sure she needed EVERY single one of them! During my many years when I was AWAY from the Church, it was the voice of my Mom – and her love, the one-of-a-kind, UNCONDITIONAL love of a mother – that remained my constant connection to my family – AND my faith. I miss her EVERY day! So, to all the Moms, Grandmas, step-mothers, God-mothers, mothers-to-be and those women who wanted to be a Mom but for whom God chose a different path – Happy Mothers’ Day! Thank YOU for YOUR service – and may God bless you all! For many people the words that they hear in the Gospel are just that – WORDS! Many people believe that actually LIVING the Gospel message is unrealistic – as If Jesus lived in some supernatural “other world”! There have even been times when having a conversation about a Gospel story I am told, “Well, you know, deacon … out there in the REAL world …”. Their unspoken assumption is that because I’m ordained I am somehow not in the real world. Well, I can assure you that most deacons I know – and most PRIESTS for that matter – are certainly connected to the REAL world! History has given us a number of philosophers and thinkers who have told us that Jesus was a beautiful man – a man who possessed tenderness of heart – infinite sweetness – and universal charm. In OTHER words, they are saying that Jesus was an IDEALIST – someone who saw, and lived life, in an idealistic dream world – not a world as it REALLY is. They like to talk about Jesus, admiring His ethical code and His moral standards while at the same time, they are placing Jesus outside of this world – out of touch with reality. I suspect there are some here today who are here just to get a few moments of relief in order to get out of THIS world and enter a dream world of sweetness, vague poetry, and universal charm – a place of refuge from a world that is cold, hard, greedy and overly competitive. But the truth is that we are REALLY here in order to enter INTO this world. The truth is that God has sent His Son INTO this with the purpose and mission of transforming it – and redeeming it from within it and that, with Christ as our role model, He is sending US to do the same. How else do we understand the prayer: “THY will be done on earth as it is in heaven?” In today’s Gospel from John, we hear the words that Jesus told his disciples on the night before He died, “I am the way, and the truth and the life.” This phrase was based on Christ’s understanding that He is the ULTIMATE realist. For Him religion wasn’t a quiet side street – a sort of lovely garden or park in the middle of our metropolitan world. Oh, no! Christ was asserting that His way, His truth, and His understanding of life is the MAIN road. In fact, it is the ONLY road in this world that’s going anywhere! ALL other roads Iead us into blind alleys and ultimate dead-ends. Christ’s declaration was NOT vague poetry – a beautiful novelty to be applauded and admired from a distance. It was the REAL thing – the ONLY kind of living that ultimately works and has a true destination, a destination beyond even death itself. 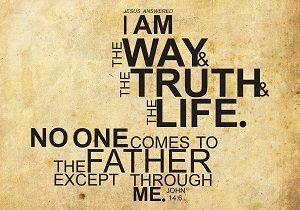 As a matter of fact, Jesus believed that His way was the cornerstone for ALL living. We hear about the cornerstone in today’s second reading from Peter. A cornerstone – we must remember – locates the site upon which a building will be constructed. It orients the direction toward which the building will face. It sets the characteristics of all the other stones that will surround it – along with their texture and their quality. All the other stones are measured against the cornerstone. The CORNERSTONE, my brothers and sisters, is the essential stone which grounds the REALITY of the entire structure. And we TOO, are called to be those “living stones” – those cornerstones – for OTHERS! The worst thing about sin is NOT what it does to God – even though it put Christ, God’s Anointed One, on the Cross and into the tomb. No, the worst thing about sin is what it does to the SINNER. Sin brings pain, suffering and ruination to the sinner. We’ve all heard Jesus’ story of the prodigal son, who threw all restraint and responsibility to the winds, went out on his own willful way and ended up – LITERALLY – in the pig pen of life. Jesus then went on to give us the only realistic thing to DO with sin – namely to face it, acknowledge its existence, see it for what it is, repent of it and then to accept the healing of forgiveness. Anyone recovering from any sort of addiction – anyone who has found the only realistic way out of the hellish jail of compulsive addiction – will tell you about it ONLY in the utter realism of recovery. There is NO hope of recovery without realism – without ruthless and courageous honesty – without a total grasp of reality. Ask ANYONE that you know who is living in successful recovery from addiction if THEY are living in the real world or a dream world? The Twelve steps for recovery are all radically grounded on the way, the truth and the life of Jesus Christ. The fourth and fifth steps require that one make a searching and fearless moral inventory of themselves and then admit to God, to themselves, and to another human being the exact nature of their wrongs. As a matter of fact, when you take a look at the fundamental process of psychiatric therapy you will recognize right away the fact that the road to recovery involves the taking of responsibility for one’s actions – and then seeking a healthy resolution for what one has done. And in what do we find in that resolution? We find it in taking ownership of our decisions – and in seeking forgiveness. Let me suggest now that maybe it’s time for each of us – TODAY – to enter the REAL world, accept responsibility for OUR actions, seek resolution and forgiveness and LIVE the words of the Gospel – the way and the truth and the life of Jesus Christ , as members of His family. He gave us His Father. He died on the Cross giving us His mother. He declared that WE are ALL His brothers and sisters. And He asks us to live each day in a conscious decision to live out our lives in relationships with those that are ALSO living in His family – and under the care of His Father and His mother. In this fragmented, hostile, and broken world of ours – a world FILLED with broken hearts, broken promises, broken trusts, and broken families – in this world that is more and more littered with damaged human hearts and souls, in a world with an ever increasing culture of destruction and death just what is MORE realistic??? To live as Hollywood, us in their so-called “reality” shows – or to live in the family in which Jesus Christ invites US to share life – with Him? When anyone declares to you that Jesus was an idealistic dreamer – a man of “infinite sweetness, vague poetry, and universal charm” – when anyone talks to you about religion as if its ONLY purpose is to mold us to live politely and to have good manners then realize that such a person is only fooling you. THAT person – is himself – “utterly unrealistic about life.” God expects much MORE from us than just that. Living in truth – and living in love – makes demands on us demands that require the courage of faith and the sacrifices of love.